Front row (left to right): 1. Larry Behling, 2. Linda Huff, 3. Marilyn Call, 4. Leslie Behling, 5. Mike ____, 6. Clifford Sorenson. Second row: 1. Steve Brandt, 2. Dan Thompson, 3. Afton Call, 4. Sally Smith, 5. Chari Edgar, 6. Karen Black, 7. Kris Jones. Third row: 1. Arthur D. Thomas, 2. Dennis Parker, 3. Pete Nielsen, 4. Bob Ruff, 5. Dale Nielsen, 6. Paul Pyle. Credits: From the collection of Sally Smith. Scanned by Sally Smith. This group met every school day at 6:30 AM. The kids in the picture were students at Livermore High School, Granada High School, and Amador High School. 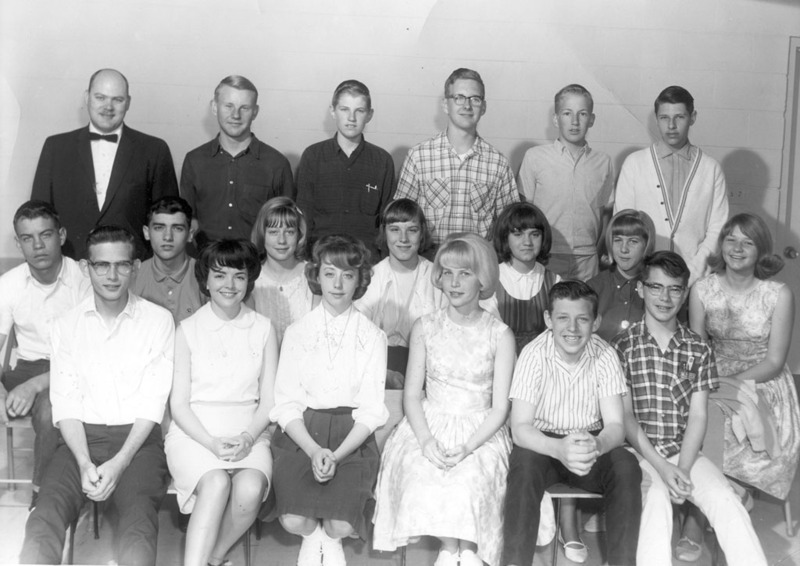 To find other pictures from Livermore High and Granada High in the archive, see Livermore class pictures listed by school. And if you have any pictures from the Livermore Schools of this era that you would like to share, please submit them to the Archive. To find other pictures of classes and youth activities sponsored by the Church of Jesus Christ of Latter Day Saints, see the index to pictures from Sunday school, church groups, and other religious associations.